Home / The Archives / How Was Your Commute Today? A weekly question to hopefully inspire and motivate. So how was your commute today? There was no commute for me today. While the significant other is out of town it is my job to take care of our two dogs, one of them is only 6 months old and can’t last inside as long as commuting would make her. My ride with happen tonite after work. Stories, links, and photos encouraged! 5 degrees and sunny. My first ride with my Nokian Hakkapalitas–tires with carbide studs, for those in softer climes. They made a huge difference–the packed snow felt as secure as asphalt. Nobbies are slow, and I miss my clipless pedals, but it still beats the hell out of the bus, let alone driving. Had a nice ride in but took longer then expected. I ride the ACDC path for most of it’s length and this morning I came across a car in the canal so waited for PHX fire and police I was on my way again. My ride in is every once in a while exciting. 35 degrees and sunny. very few others out for a sunny sunday. too cold i guess. passed two fellows equipped with $10,000 of bike and clothes between them. they were riding abreast and i didn’t feel like ringing my bell to suggest they move out of my way — i just took the traffic lane (50mph highway) and went around. later i stopped to toss eucalyptus branches out of the shoulder, blown there from a recent storm. on the way home i swerved around some vomit left on the side of the road. later i saw a feral kitten resting alongside the highway. i stopped and shooed her away from the dangerous traffic. Cloudy and 40s here this morning. I didn’t have to work but left early for the grocery store hoping to avoid the rain that’s coming. I had a great ride today cruising through 3 inches of fresh snow in Edmonton. I work and volunteer at a campus/community radio station in Edmonton, Alberta, Canada. I produce a show that features short interviews with bike commuters to find out what the bike traffic is like in cities around the world. We call our show the Bike Traffic Report and it’s an actually traffic report (with tongue in cheek…and a bit cheeky) that reports on bike traffic. We would love to phone you to get your bike traffic report on the radio in Edmonton and to find out more about your bike commute. Please drop me a line if you would like to participate. Phone me at 780 492 2577 ext 2 or send me an email drichel@cjsr.com. I was afraid we’d have freezing rain today here in Rochester, NY but the road conditions were actually quite nice. I left a half hour late at around 9:30am and at some points in my journey it felt like riding through a ghost town. 6:30 this morning it was a little warmer. I think about 10f. For the three mile ride I stayed nice and warm. Last week when I rode the bus in the morning because I wanted to get more experience before riding in the dark on snow. All day I did not feel like my self : ( . It was the first time in over 3 years I did not bike to work and I hope I never have to do that again. If you know how I feel when I don’t ride in the morning, think WOOL. Comming home, must be in the mid 20’s and sunny : ) wishing my ride was more than just 3 miles…. Our first “big” snow in Boise, Idaho this morning made for a beautiful ride. I was nervous about the somewhat slick-treaded Armadillos I forgot to change off last night (and didn’t have time to this morning), but they rode just fine. Took it slow, saw a few red-nosed smiling co-crazies on the route, and made it to work over-hot from over-layering. Above freezing and heavy drizzle this morning but clear (albeit wet) and warm this evening. I was worried about black ice but I think that will be more of an issue tomorrow morning. I took a ride down our city’s first street-level segregated and painted bike lane on the weekend and it’s looking great! (http://www.socius.or.kr/2007/12/08/good-news-for-daejeon-cyclists/). I love that it’s being used and it’s not even finished yet. 20 F with 3 inches of soft, fluffy snow on the ground and more coming down. I didn’t think the hybrid with slicks would handle it (and the old, packed snow and ice underneath from previous snowfall) so I walked. It was beautiful out, though, and walking gave me even more time to enjoy it. 30 degrees and a little fog in the Eugene/Springfield area. Perfect weather for keeping the perspiration down. In Green Bay WI, it is 29 with occasional ice pellets. I switched over to my fully rigid mountain bike with wider tires to handle the snowy/icey roads. The city has decided to save money by only plowing when needed. The needed part could be debated. A fun ride never the less. With the deeper grey sloppy snow I have put away my cross bike until races. Have a great day. Last night in Edmonton, Alberta, Canada I rode home from work on an unplowed bike path. It’s a slight up hill for about 2 km, so it was hard work especially with the mixed snow conditions. However, this morning it’s plowed all the way! Plowed and downhill; much fun plus a great pink sunrise over the frozen river valley. 55 degrees in Carrboro before the sun rose, high near 80, awesome commute. Mid 50s in San Diego this morning. Sunny as usual, and a beautiful ride. The snow’s been melting here in Chicago; last week was slushy and treacherous (with lumps of ice under the slush trying to kick your wheels out to the side). At 5 or so mph, it was a challenge not to dab. The yellow fenders are treating me very well, and I haven’t had to wear more than a wool sweater (+ long johns), even down to 15 degrees or so. Final winter prep still to do: sew up helmet cover, knit (well, spouse will knit) ear warmers, and swap out tires for winter: 23mm for 28mm with some grip to them. But the ride, Dingbat, the ride!– crisp and quiet at 6:30 AM on Monday, 7:00 Tuesday, and 7:30 today. Evening rides weren’t long enough to discharge the stress from work: going straight home rather than picking up my daughter at day care, but yesterday at least I got to do a grocery run, and have a little fun going fast–I like to think of it as ‘not slowing the cars down’ but they may think I’m racing them. Today, a sunny jaunt around the neighborhood at midday to drop off some work at another building provided just the relief I needed from spending 9 straight hours in my cube. In Charlotte it is still 60-70 degrees this past week. I hope it goes back to being somewhat cold soon! 52 degrees this morning in Durham, NC — dry, and high of about 68. Great ride. 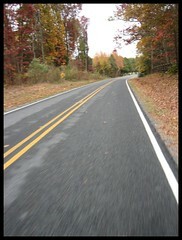 Record highs may not get you in the Christmas spirit but they are sweet for riding. 3 days in a row of shorts. 30 degrees in Tulsa today and for the first time this week, no freezing rain. Power is out for more than half of the city and the trail I usually take to work looks like a disaster area. Thanks to this site I had an alternate route planned. Riding is better than driving under any conditions.